53 classic stories include "Rumpelstiltskin," "Rapunzel," "Hansel and Gretel," "The Fisherman and his Wife," "Snow White," "Tom Thumb," "Sleeping Beauty," "Cinderella," and so many more. 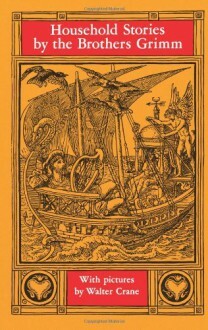 Lavishly illustrated with original 19th-century drawings by Walter Crane. 114 illustrations. This is a book filled with many different stories by The Grimm Brothers. This would be an excellent book for older students who are looking at myths, folktales, and short stories. I absolutely love the Grimm fairytales. I think that you could do a lot with this in the 5th-6th grade. Like comparing the Grimm fairytales to other versions of the stories. This collection is a load of interesting little stories. These originals are way more twisted than fairytales of my childhood. In these versions, the repercussions are more bloody and less forgiving.